The community served by Sandwell and West Birmingham NHS Trust will be pleased to hear that their long awaited new hospital the Midland Met, will once again ring to the sound of heavy machinery as the builders move back in. The news follows the Department of Health and Social Care agreeing to provide the funds to finish the building through a publicly financed direct contract, after the collapse of Carillion in January. Procurement for the main contract will start next month (November). The contract for interim repair to the two thirds built hospital has today been signed off by the Trust’s board, and awarded to Balfour Beatty. The company will be on site from Monday 8th October, with work due to commence by 22nd October, and work is expected to take six months. Thomas Edgcumbe, Balfour Beatty Managing Director for its North and Midlands regional business, said: “We are delighted to be able to support the Trust on this key hospital project which is vital for the local residents and the wider community. Eight months after the collapse of Carillion, and the consequent pause on construction of the new Midland Metropolitan Hospital in Smethwick, the project’s future has been secured. The new build will be the main acute hospital for almost three quarters of a million people across north and west Birmingham and the borough of Sandwell. Completion will unlock resources to invest more in local general practice and mental health services, and is the centrepiece of a strategy for integrated care which is at the forefront of the NHS Five Year Forward View, and anticipates the ten year plan for the NHS, due to be unveiled later in 2018. In early August 2018, Sandwell and West Birmingham NHS Trust launched a competition to win an enabling works contract to prevent the deterioration of the construction site. That contract is to be awarded in September. At the same time, the Board of the Trust reversed prior decisions to proceed on a private finance model, and opted for a direct contract with a building contractor to finish the new hospital, with funds to be provided from central Government. This proposal was submitted to the Department of Health and Social Care and to the Treasury on August 2nd. “Our long term plan will see the NHS receive £20.5 billion a year more than it currently does by 2023, but our commitment does not stop there, as this important partnership shows. “By taking this bold step, we are not only giving patients in Sandwell and west Birmingham world-class NHS facilities on their doorstep but also showing our determination to build an NHS fit for the future – all whilst making sure taxpayers’ money is spent in the best possible way”. “This is absolutely fantastic news. After a huge amount of work by teams across Whitehall and the Trust, and with the voices of local residents, clinicians, and stakeholders having been being clearly heard, we are delighted that we now have a definitive publicly financed plan. We will continue to engage with the construction market over coming weeks and build towards a formal procurement by November this year. We always said Midland Met would be delivered and the doubters were wrong. The Prime Minister’s promise is being honoured. Issued by: SWBH NHS Trust Communications, telephone: 0121 507 5303. The Midland Metropolitan Hospital Outline Business Case was approved in July 2014 and the new hospital was scheduled to open in 2018. Carillion was contracted to construct the build, through a PF2 Special Purpose Vehicle. Carillion entered compulsory liquidation in January 2018, and the SPV project agreement was terminated by mutual agreement in July 2018. The Early Works contract will undertake remedial work and prepare the site for final construction completion. This contract will be awarded in September. Services across Sandwell and City Hospitals remain in place, but the local CCG and Trust expect to reconfigure some acute and emergency services in 2019 to bridge the impact of the time delay to the new single hospital. Sandwell and West Birmingham Trust Board members have agreed a preferred option to finance the completion of the Midland Metropolitan Hospital through a publicly funded model. 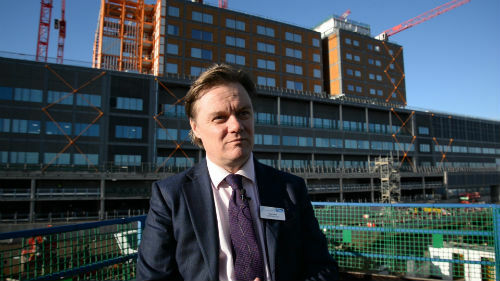 Toby Lewis, Chief Executive, said: “The construction site for the Midland Metropolitan Hospital continues to be secure and yet all construction work remains paused until a resolution is found. It is extremely unfortunate that we are starting to see deterioration to some of the building materials and it is now clear that some work that has been completed will need to be redone. The full costs of that rework and deterioration will be fully understood this month but are expected to exceed £10m. That cost could increase if construction is not progressed before next winter. Toby Lewis, Chief Executive, said: “We continue to report the position factually and straightforwardly to our Board, which helps staff and local taxpayers to know what is going on at this difficult time. It is not in dispute that the Midland Metropolitan Hospital is needed urgently and that 2018 was the preferred date for a project which started a decade before. “Arrangements to maintain safe services until 2020 have been developed, but some options for finishing the hospital take the opening date well past that timescale, perhaps as late as 2022, and would, in all probability, necessitate interim service reconfiguration between our sites in 2019. This is something partners are working to avoid, but as time goes by it is becoming more probable that a slower building route will be chosen, with increased cost and disruption. Sandwell and West Birmingham Hospitals NHS Trust this week received more and ongoing welcome support to progress the construction of the Midland Metropolitan Hospital, that was affected by the insolvency of Carillion announced in January 2018. Clinical quality issues in urgent and emergency care, and workforce recruitment issues, drive a view that this vital new hospital, that is two-thirds built, proceeds rapidly. This will mean that patients can receive safe, high quality care in purpose-built facilities, seven days a week. Toby Lewis, Chief Executive, welcomed the continued support from partners. He said: “This week has demonstrated the absolute commitment from all involved to work together to get this project back on track, so that the new hospital can open in 2020. That means construction work re-starting in the spring sunshine enabling our patients to get the long-awaited new acute and emergency hospital that they deserve. “I am pleased that so many partners are behind the project, including local MPs John Spellar and James Morris, and the West Midlands Mayor, Andy Street. The Prime Minister reiterated her commitment during PMQs on Wednesday and we are hopeful that we will get the green light to progress a solution to get the hospital completed in 2020. “The Trust’s Board does not yet have a final view on how to finance and construct this key project. But what is clear is that a decision point must come soon and that if at all possible we need to bring an end to site degradation, which is costing money week by week on rework. We have published an estimate of the extra cost that private or public funders will need to meet and we are working constructively with all partners to finalise decisions. Toby Lewis, Chief Executive of Sandwell and West Birmingham Hospitals NHS Trust, spoke on Friday, January 19, on site at Midland Met Hospital, about the development and the current situation following the liquidation of Carillion. Tuesday January 16th, 2018, 1pm. Monday January 15th, 2018, 5pm. Toby Lewis, Chief Executive, said: “I have spent time today on the construction site of the new Midland Metropolitan Hospital and I have had a number of discussions with key stakeholders including The Hospital Company who hold the contract for building the hospital. Monday January 15th, 2018, 9am.